It’s always exciting to get a new houseplant. Your new houseplant is lush and green, and you know right where you’ll put it. The first thing you’ll do when you get it home is repot it into a decorative pot. Yep, I used to do the same thing. For some reason I thought that repotting a houseplant as soon as I brought it home was just one of those things I should do. I mean, those plastic nursery pots are boring and sometimes just plain ugly, right? But wait, don’t be so quick to repot that houseplant. If the only reason you’re going to repot a houseplant is to put it into a prettier pot – or because that’s what you always do with new plants… well, those are the wrong reasons. 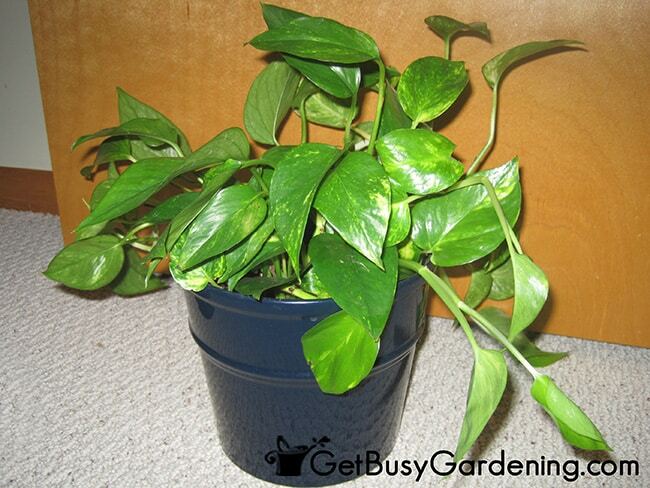 Repotting a houseplant can be very tough on a plant; they go into shock when they’re repotted. Add that to the shock of going from living in ideal conditions in a greenhouse, to being moved to a garden center (where they don’t always get the best care), to being moved again to your house… whew. The poor thing needs a break! 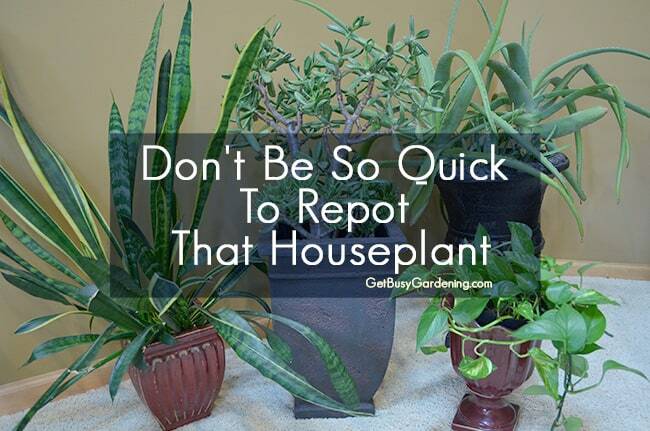 If the houseplant is showing obvious signs that it needs to be repotted, or the person you got if from told you it needs to be repotted, then by all means repot it. But if you’re not sure, take some time to research the type of houseplant you have before you jump straight to repotting it. 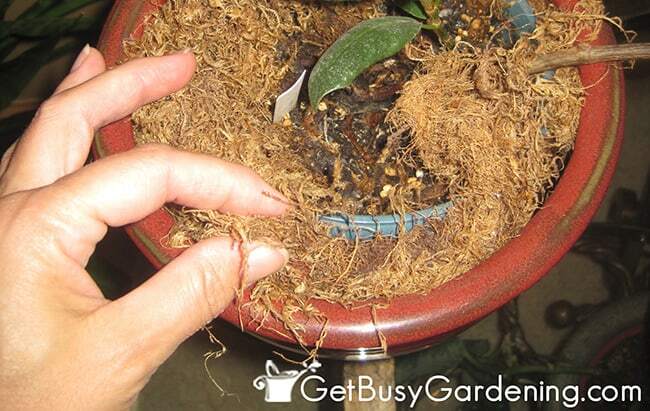 Did you know that some houseplants prefer to be pot-bound and will suffer if repotted too early? In fact, some flowering plants won’t set buds until they’re pot-bound. Many of the plants you purchase could live for a few years in the pot they come in, so why risk stressing the plant. Next time you bring home a new plant, give the plant a few weeks to adjust to its new environment. 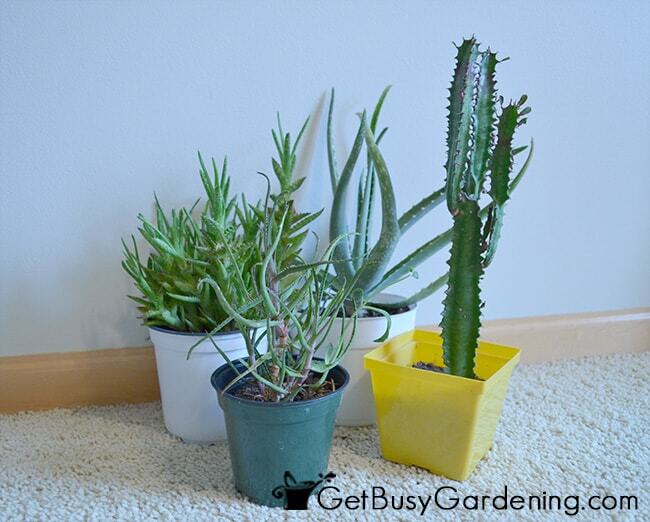 This will also give you time to learn about the ideal care and conditions the plant needs to thrive, quarantine it for houseplant pests, and monitor it for signs of stress. Wait… what about that ugly plastic nursery pot it came in (and what could be uglier than a hot pink plastic pot)? You can still use the decorative pot, just drop the ugly nursery pot into it. Ahhh, now that was much easier than repotting the plant. Actually, I use plastic pots for all of my houseplants, even when I repot them. That way, I can easily swap a houseplant into a different decorative pot if I want to change my decor. Another benefit of dropping a plastic pot into a decorative pot is that a lot of decorative pots don’t have drainage holes. Without drainage holes, over watering can be a problem. If you over water a houseplant dropped into a decorative pot, you can simply pull the plastic pot out and dump the excess water. It also makes it easier when you need to move houseplants, especially larger plants. 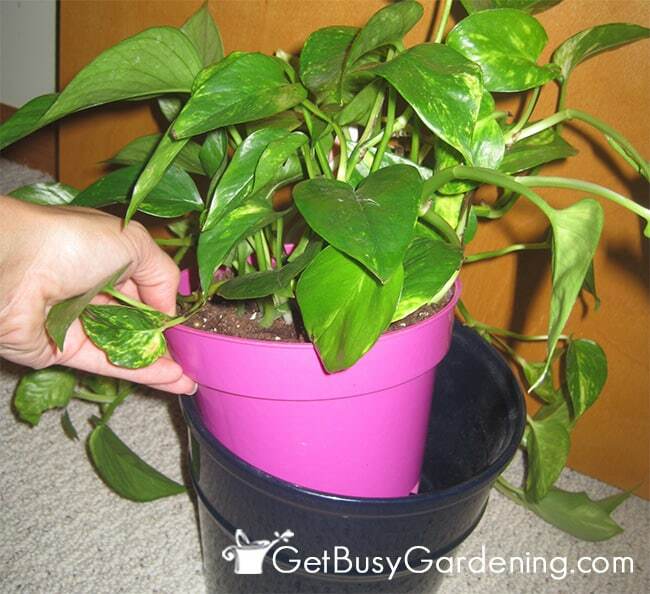 Simply pull the plant out of the heavier decorative pot, and both the houseplant and the pot are easier to move. If the decorative pot doesn’t completely hide the ugly pot, you can hide it with decorative moss. Repotting a plant for purely aesthetic reasons isn’t a good idea. Next time you’re thinking about repotting a houseplant, take a minute to think about your reasons for repotting the plant first… and don’t be so quick to repot that houseplant. Good post! I didn't realize the amount of stress being put on the plant. Thank you! Thanks Carol! Glad you liked it. Thanks for this! I wouldn’t have a clue how to repot a plant anyway! My question is do I take the plastic pot the plant is in out of the ceramic pot to water it in the sink? Or can you water it in the ceramic pot? Thanks for this! I’m going to let my new plants de-stress and adjust for longer. I also use the nursery pots to line my decorative pots. It’s great for bottom-watering with a bowl and makes repotting easier (the plastic can be gently squeezed to loosen the plant or even cut & peeled off if stubbornly pot-bound). I’m surprised more gardening blogs don’t recommend keeping the nursery pots. Hi, I read your article too late! I had already moved them into containers about an inch larger and added more soil. One of them seems to be pretty wiggly, but I don’t want to pack it too tight. Any advice on this unstable plant and how to care for these that I’ve already moved? LOL, we’ve all been there for sure! The only thing you can do is monitor your plants to make sure they aren’t suffering after being repotted. Leave them in their spot, and don’t move them until they have recovered (moving them too much can cause further stress to some types of plants). As for the one that’s loose in the pot, you can just leave it for now. The soil will settle in each time you water it, and once it settles you can add more soil to the top if necessary. Otherwise, you could try gently packing the soil down a bit more with your fingers, and adding more soil to top it off.